This 24mm lens produces a 84.1° FOV when used with full-frame cameras. Hybrid aspherical lenses render sharply defined images with a minimum of distortion and chromatic aberrations, with a minimum focus distance of just under 10" from the lens. A removable petal shaped lens hood provides flare protection when shooting without a matte box, the lenses threaded front accepts a 77mm filter ring. ED, extra-low dispersion glass, helps reduce chromatic aberration and can improve contrast and color saturation. 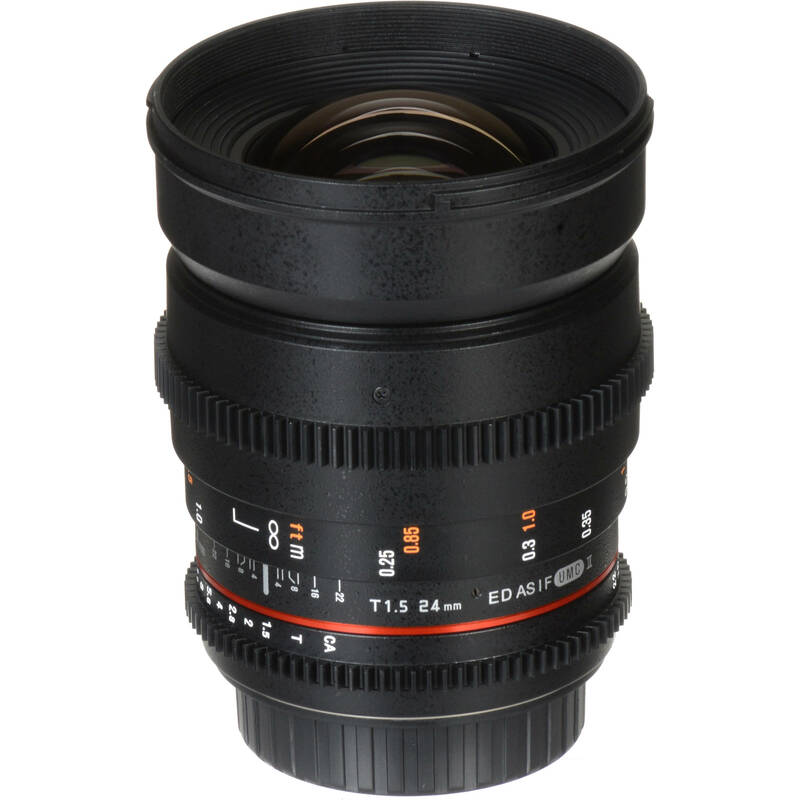 24mm T1.5 Cine DS Lens for Canon EF Mount is rated 4.4 out of 5 by 34. Rated 2 out of 5 by Reese from Clearly not made for the GH5 Before purchasing, I had used these lenses on the A7s II and loved them. The images were sharp and beautiful. However, they are very obviously not meant for the micro 4/3 sensor. This lens is unusable when opened up to t1.5, which is incredibly annoying since that was one of the main reasons I bought it. I can't get a sharp image until I stop down to around 2.8. If you really want these lenses for your GH4 or 5, I can only recommend buying the EF versions and adapting them. Something clearly went wrong when transferring the lens to Micro Four Thirds. I really wish someone had told me this before I bought them. Rated 5 out of 5 by Jeff from PRETTY AND WIDE: I produce indie film. I purchased this lens as part of the four lens DS bundle. The 50mm is a favorite among Rokinon owners, and I too love it. This 24mm lens is a close second or third as it performs very well for me. I am using these lenses with an adapter on a Sony FS7. As with all the other lenses in this bundle, T1.5 is amazing at this price point. It certainly has more plastic in it than other lenses I own. The powder coating does a good job of not showing fingerprints. Smooth rings. I will say that of all the lenses in the bundle that I got, the lens hood on this one does not snap as tight as the others. Not really a big deal, but I noticed it. Rated 1 out of 5 by Noah A. from Color shifts with aperture. Slop in focus mechanism. Like the other lenses in the bundle I bought the 24mm Cine DS I received produces a greenish at apertures narrower than 2.8, however wider than about 2.8 I perceived a pretty dramatic shift towards magenta. I can live with the green cast, that's fine as long as they're all consistent it's easy to fix in post. Especially given the amazing price, however inconsistent color cast is is a deal breaker. Another deal breaker is the almost full tooth's worth of slop in the focus ring. Rated 4 out of 5 by Justin W. from Great up close, tougher further off The most important thing you should consider when buying this lens is how close you are going to be to your subject. The focus ring has a huge travel distance (which is what I was after), but the VAST majority of that travel is for shooting things between 1' and 2.5' away from you. From 2.5' to infinity only uses the last 20% of the focus ring's total travel distance. If you need to get a fast focus on a subject further away than 2.5', you're going to have a slightly tougher time. I'm not a super pro, so maybe this problem is partially my inexperience, but it's impacted me enough to bear mentioning. Part of me wants to pick up the 50mm Cine DS lens to get those more distance shots, but money is tight right now for luxury purchases like this. That being said, the video I've shot with it so far is really sharp and beautiful. On my Canon 60D, I'm able to drop my ISO lower than I ever thought possible indoors. The 1.5 aperture is amazing, but I can get great shots in low light even at 2.8. It's worlds apart from my Canon 18-200mm/f3.5 kit lens. This lens feels solid and well built. And with the built in gears, I cannot wait to pick up a follow focus. Rated 5 out of 5 by Joe C. from Excellent Lens for Cinematography I use this lens to shoot various projects including weddings and independent films. The image quality and clarity are fantastic and the manual focus is extremely smooth. The de-clicked aperture is great because it can be extremely fast and you are able to expose during recording, although I would stay away from that unless absolutely necessary. It is a little bulky, especially with a lens hood. Switching out lenses make take slightly longer and storing it in a bag may prove a little more difficult then with some other lenses. But it's definitely worth it. Rated 3 out of 5 by DoPSaroV from A lot of lens for the price! I've used the previous gen Rokinon Cine lens kit. The Cine DS version is a step up. The construction feels a bit more solid. I Love that there is a 50mm now in the kit and that all the lenses match. I just wished the did a little better with the 24mm. It still has the same problem as the original 24mm version. You can't used this lens wide open. It is far softer wide open than any of the other lenses. Rated 5 out of 5 by Aaron W. from Upgrade to Cine I have LOVED moving away from the Canon L series 24mm to this lens. It's not QUITE as bright, but the SMOOTH focus and iris rings are incredible. I'm also loving being able to have my shutter speed set and ISO low, and quickly being able to adjust exposure with the iris ring. It's making my run and gun workflow so nice that I would love to trade in my Canon 50mm for the new Rokinon 50. Super pleased. And this thing is a third of the price of the Canon or something like that! Rated 5 out of 5 by armircam from Best Cine Lens for the Indie Filmmaker I am a college student with a very limited budget. I recommend this to any indy filmmaker/those starting out. This is a great cine lens. Great built, very smooth aperture ring and focus ring! I would not hesitate to buy another cine lens from Rokinon. Best bang for your buck! How well would this work on a Canon Rebel T5i? This lens covers full frame so it will easily cover the smaller APS-C/Super35 sensor of the Rebel T5i. The image and build quality is a bargain at this price. Do know this is all manual, both focus and iris rings. There is no electronic communication between the camera and the lens so no lens metadata. The iris ring is click-less so smooth iris pulls can be made shooting video. how will it work with Sony PMW F3? You can use this lens on that camera. You will need an adapter. See below. You will not need the adapter's aperture feature with this lens but you will if you get Canon EF lenses. How long is the focus throw? This is a cine-type lens so it is about 1 1/4 -1/2 turns as against a still AF lens of about 1/8th of a turn. Do you have to disengage shutter lock if using Rokinon 24mm T1.5 cine DS lens on a 5D mark ii? You can use this all-manual lens on the 5D Mark II without issue. Since you have to set both focus and aperture by hand, using the Manual, Shutter or Aperture modes is recommended. Is there a replacement hood available? This lens does have a removable hood, however we do not have that available for a separate purchase. Feel free to email us directly at provideo@bhphoto.com and we can guide you in the right direction for a replacement part. what is the AOV on a BMPCC super 16 size sensor ?? The original Pocket Cinema Camera has a 2.88x crop factor. This would be the equivalent of a 69mm lens on that camera. What is the difference between this lens that costs $584.00and the Samyang 24mm T1.5 VDSLRII Cine Lens for Micro Four Thirds Mount that cost $699.00? No difference since they are made exactly the same except for the name badge. I would get the Rokinon. It normally is more expensive but it is on special sale right now with a limited supply.